For Canada to meet its 2030 and 2050 climate change commitments, substantial changes are required in the country’s energy, agricultural and industrial systems. Previous agreements on greenhouse gas (GHG) emissions targets (Kyoto for 2010-12 and Copenhagen for 2020) were not successful. In large part, they lacked a strategic plan for deployment that included the nature and timing of the technological, infrastructure, and behavioural changes (called ‘pathways’) capable of achieving the stated objectives. 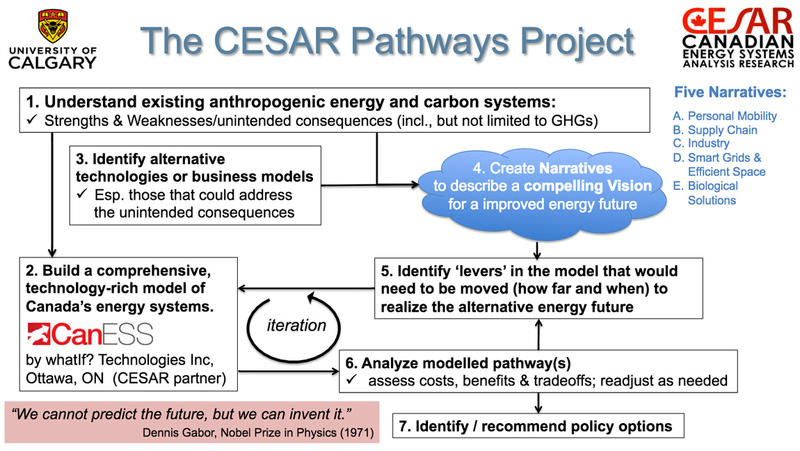 The CESAR Pathways Project applies new and powerful scenario modelling tools to explore compelling visions and credible strategies for systems change, with the goal of identifying transformative pathways to sustainability. Click here for a backgrounder, including how the unique CESAR Pathways Project differs from other efforts to describe pathways. Click here for a slide presentation that provides an overview of the CESAR Pathways Project. CESAR’s visioning and modelling tools are built around detailed narratives that describe desirable, achievable changes in human-managed systems that include, but are not limited to, GHG management. From the narratives, pathways are defined to inform decision makers in government and industry. The power of the CESAR modelling approach is that each narrative can be rigorously explored and assessed to stimulate discussion, inform decision makers and move society towards a collective vision for a promising future. As part of this project, CESAR is consulting governments and industry groups across Canada to understand the narratives or plans they are considering for reducing GHG emissions. This consultative process will help modify and inform the CESAR narratives. CESAR and the University of Calgary greatly appreciate the philanthropic support from the Edmonton Community Foundation that makes this work possible. Supplemental funding from the National Energy Board is being used to support our consultation process with governments and industry. To carry out this major initiative, and to enable CESAR to embark on other projects, we seek additional partners to help us identify new narratives, enhance the scenario modelling process, make the modelling tools widely available to others, and communicate the insights.